Kicking it off with my Best of the Four today: Archie Comics’ Archie 1941! 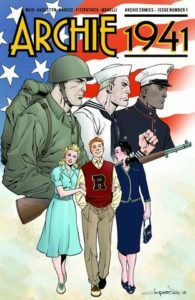 It’s the summer before America enters WWII, and Archie Andrews just graduated from high school, having a lack of direction, it seems that Archie might join the war effort. With great art that feels both modern and nostalgic, Archie 1941 promises to deliver in ways that I feel the Archie run hasn’t since the inception of Riverdale the television series. With only one page in the back dedicated to Riverdale, maybe the good folks over at Archie Comics have realized that we were getting a bit tired of the comic being an ad machine for the show. I’m excited for this series! It’s added to the pull list. This one has promise. 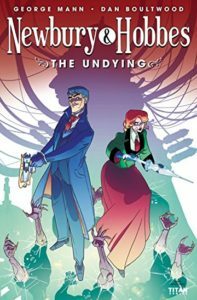 This is a neat little Sherlock Holmes/James Bond-type book with a splash of the occult. Buddy comedy crime-drama in full effect! The art is clean and crisp with unique page layouts tossed into fairly straightforward panel layouts, but the subtle uniqueness of the pages blends well with the subtle uniqueness of the characters, their situations, and the snarky dialogue. It’s a fun book. One to check out if you dig everything that I just mentioned. And in theme…it pairs well with the next title; lots of occult stuff hitting the shelves today! Ah, Mignola occult in its purest form…I guess…maybe not. 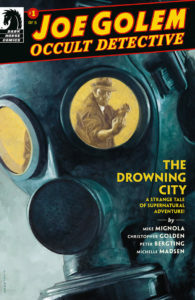 I dig a lot of the Hellboy world stuff that Mignola puts out there, but this title is a bit convoluted for my tastes. The colors and art are a bit monotonous, creating a feeling of “Wait, who is that again? What are they doing? And with whom?” With the Hellboy books, there is enough blank space and dark corners to keep the page interesting, not to mention Hellboy’s stark red tone pepping up the page, but this book lacks that flair and punch that I’m used to from a Mignola/Dark Horse title. This is a pretty cool issue #1. 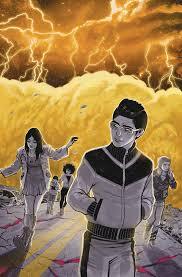 A group of teenage refuges, in an American wasteland, run from a war-torn East Coast. They encounter death, destruction, and bands of bandits as they attempt to figure out their place in a crazy world. Lots to fill in as magical necromancy powers seem to appear in one of the teens. The art is good. Nothing ground-breaking or departing from the norm. It looks like Suiciders: Kings of Hell A but a Nickelodeon version.